"I will assure you there will be no impunity in this sad, painful case or in any other," said López Obrador. 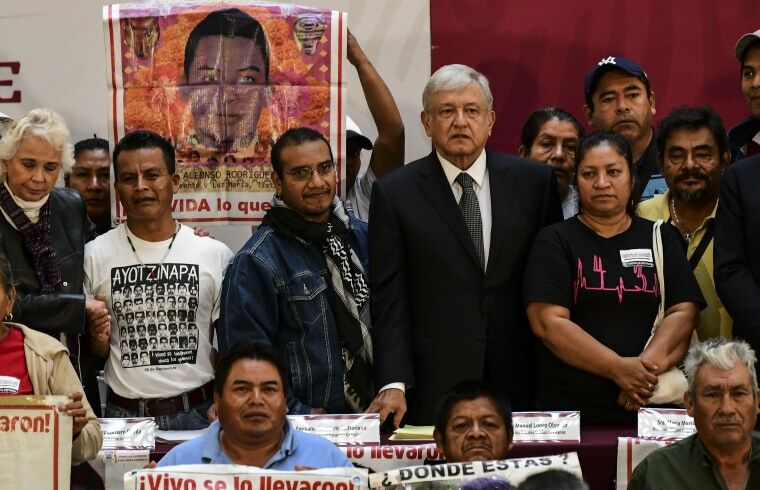 Mexico's new president, Andrés Manuel López Obrador, signed a decree Monday creating a truth and justice commission to investigate the 2014 disappearance and apparent killings of 43 students from a teachers college in the state of Guerrero. Flanked by parents of the missing students, he said the truth commission will be an example of how "human rights will never be violated again." On Sept. 26, 2014, local police in Iguala surrounded several buses the students had taken to attend a protest. Survivors said the police started shooting at unarmed students. After the incident, six people had been fatally shot and 43 student teachers could not be found. López Obrador has made ending "corruption and impunity" one of the cornerstones of his new government, as he said in his inaugural speech on Saturday. On Sunday, Mexico's new president boarded a commercial airliner and flew coach, telling Telemundo in an interview that there will be no "lujos" — luxuries — in his government.